I am a big fan of Sundays, of church-going, of Sabbath-keeping and of the fellowship of the saints. In fact, I could probably count on my fingers and toes the times I have ever missed church. I grew up going every week because my parents were faithful laypersons who served in Sunday school, church choir, church council, leadership, prayer teams, you-name-it-they-did-it. So it comes as no surprise that as an adult, I ended up marrying someone with a similar background and experience. Luckily for me, the military chaplaincy has ZERO expectations or requirements of chaplains’ wives so any and all serving/ministering/volunteering has been of my own accord and out of the joy in my heart to do it; not because there’s some awkward expectation. I joke that over the past four years NO ONE has asked me if I sing solos or play the piano. I do, however, believe in using my God-given gifts, talents and strengths to serve alongside Ryan as a team. I do, strongly believe that my role is just as important as Ryan’s although it may manifest itself very differently in the day to day sense. I have been faithful to lead Bible studies, preside over women’s ministry groups, open my home up for prayer group and I’ve hosted and cooked a hundred meals and casseroles in the name of hospitality. So when I admit that I occasionally play hooky from church it is in no way meant to demean the church-going, worship experience. It is meant to say, I, like you, am a normal human being that sometimes needs a day off. Sometimes I need a break. Such was the case this past Sunday. Ryan left before 7:00 am and even after planning the night before to sleep in and stay home, my internal body clock assisted me in jumping out of bed around the same time. My goal was just to have a morning at home. To relax. To rest. To rejuvenate. For some, you can do that by staying in bed all day or lounging around watching television. I wish I had a “relax” setting but for me, that usually looks like making a giant to-do list and strategically and systematically marking through every last item. That, my friends, is what charges my batteries. I was in overdrive and on a roll. I had finished over half the items on my list before 8:30 am. It almost felt as if the time were magically going slowly. It felt like bonus time. Out of habit, a teensy-tiny part of me felt a slight twinge of guilt. 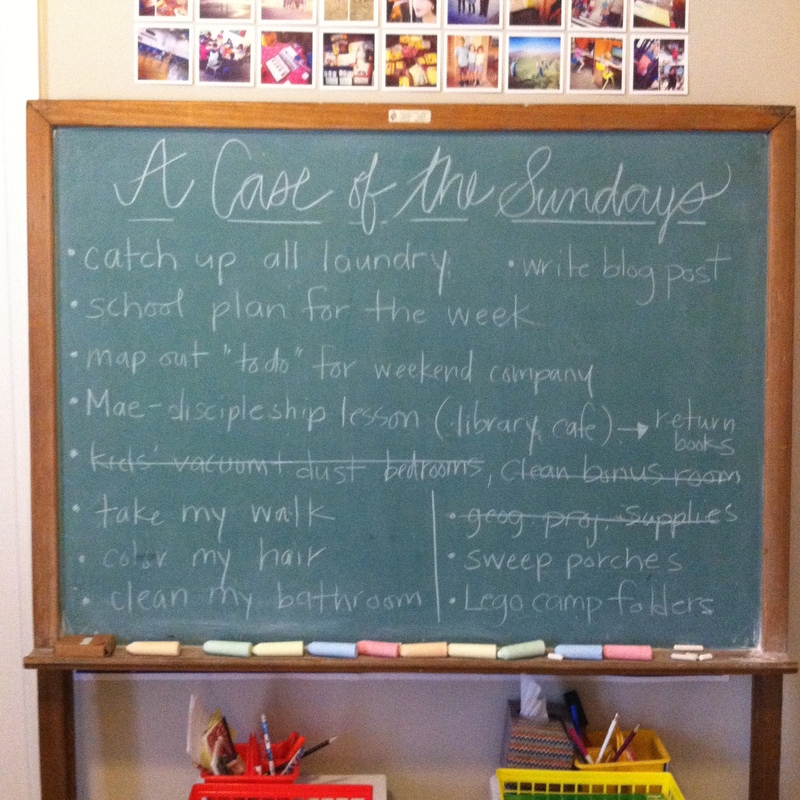 It felt as if I were cheating on church or God or something by being at home, (not out of town or on vacation) and being well enough to charge ahead on my to-do list (not sick or feeling poorly). I know where this guilt comes from (another-blog-post-for-another-day) but I decided in that moment, I was refusing to allow some faux-culpability or life-long burden steal my joy. I was going to take my Sabbath, keep it holy and honor God anyway. At home. By getting my heart and my house in order for the coming week. And that’s just what I did. One of my sweet chapel friends texted me out of concern and told me she missed seeing me there. I replied that I just needed a morning at home. The week prior I had not managed my week well. I’d taken on too much. Been away more than I’d been home. Been running too hard and fast. Said yes to too many good things. And the result was that I’d inadvertently given away too much of myself outside of the home. Sunday was the morning I needed to just plant myself at home and engage myself in those things that are helping me to focus my time and energy exactly the way I want to this year. As much as I hated to use a Sunday morning as the time to do this, I did it anyway. This year, I’m refusing to let too many days or weeks go by where I feel out of sync. I’m nipping it in the bud. Nip. It. In. The. Bud. Maybe I’m the only one. Maybe I’m a justifier. Maybe it’s just me who thinks God is more concerned about the state of our hearts and homes than he is keeping a record of attendance with posters and gold stars for all of the good little girls who never miss a Sunday. 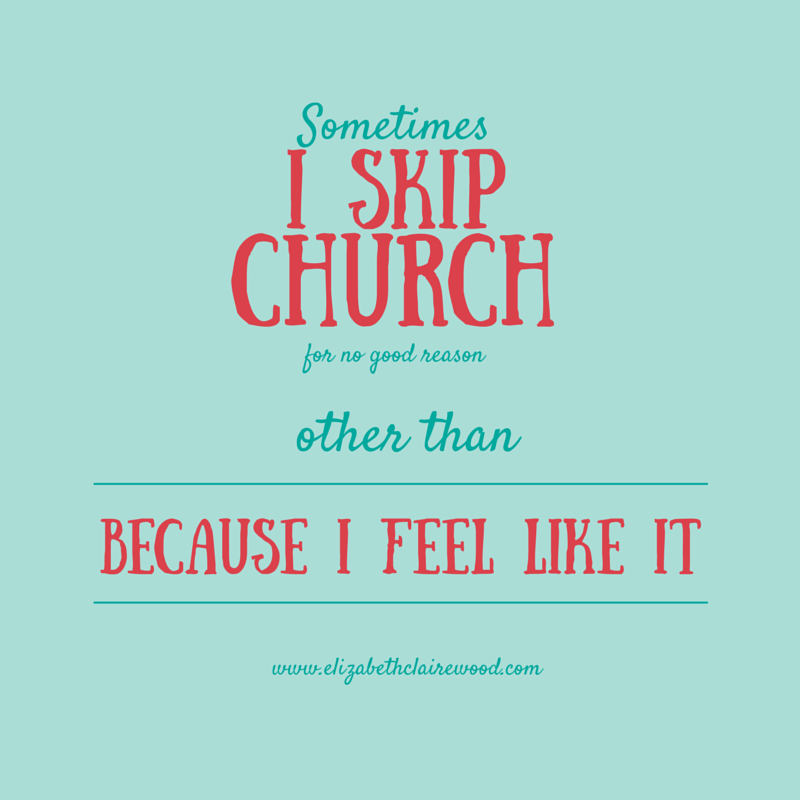 Do you ever feel guilty for skipping church just because? What other ways have you spent a Sunday that restored your soul? I’d love to hear from you. We skipped church right before the kids got out of school for Christmas break and took a short trip up to Gettysburg. With the hustle and bustle of the holidays coming up, we felt like we had not had much family time and decided to utilize a gorgeous day, (Sunday) to spend time enjoying each other. It was wonderful and very rejuvenating. Thanks for sharing. I have found it much easier in the Army to be “real” in front of people. Not that we weren’t during our 12 years of local church ministry, but the glass house can make you not let your guard down near as much. Thank you for this post. YES! I feel guilty for skipping church just because. While I hadn’t planned on skipping, it happened a few Sundays ago. We’d had a busy week and a busy Saturday too. I was TIRED. Sunday morning rolled around and I couldn’t do it. Just couldn’t make myself get out of bed. Tim got up and went off (he drives separately anyway) and I went back to sleep, rolling out of the bed around 9:30. I got up, had my devotion time, cooked breakfast for Rachel and me and leisurely did laundry. What I mean by leisurely is that I took my sweet time about it and didn’t jump up every time a buzzer went off. It. Was. Heavenly. I was relaxed and happy and ready to start the week off right and not grudgingly because I felt like I didn’t have a weekend. I truly believe we need those “mental health” days every once in a while to recharge our batteries. And I’d like to think that our gracious Lord doesn’t begrudge us one if it happens to be a Sunday. It does happen sometimes Karen. =) And I, too, think the Lord knows our hearts and our needs better than anyone. I skipped church this morning and did my devotion at home. I needed time to to relax in the at home with no one else around except the presence of the Holy Spirit. This post was meant for me! Thanks for sharing your heart! It doesn’t happen often, but sometimes, I just have to! Sometimes, I just can’t explain why except that I just can’t! And, as long as my husband is ok with it…I stay home and just rest!